Sound frequency discrimination begins at the organ of Corti in mammals and the basilar papilla in birds. Both of these hearing organs are tonotopically organized such that sensory hair cells at the basal (proximal) end respond to high frequency sound, whereas their counterparts at the apex (distal) respond to low frequencies. Sonic hedgehog (Shh) secreted by the developing notochord and floor plate is required for cochlear formation in both species. 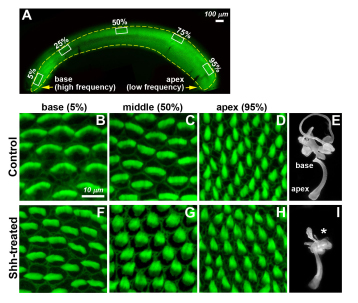 In mice, the apical region of the developing cochlea, closer to the ventral midline source of Shh, requires higher levels of Shh signaling than the basal cochlea farther away from the midline. Here, gain-of-function experiments using Shh-soaked beads in ovo or a mouse model expressing constitutively activated Smoothened (transducer of Shh signaling) show up-regulation of apical genes in the basal cochlea, even though these regionally expressed genes are not necessarily conserved between the two species. In chicken, these altered gene expression patterns precede morphological and physiological changes in sensory hair cells that are typically associated with tonotopy such as the total number of stereocilia per hair cell and gene expression of an inward rectifier potassium channel, IRK1, which is a bona fide feature of apical hair cells in the basilar papilla. Furthermore, our results suggest that this conserved role of Shh in establishing cochlear tonotopy is initiated early in development by Shh emanating from the notochord and floor plate. 1E.J.S. and J.-H.M. contributed equally to this work. Author contributions: E.J.S., J.-H.M., J.Y.C., D.K.W., and J.B. designed research; E.J.S., J.-H.M., H.A., J.-O.S., and J.B. performed research; E.J.S., J.-H.M., H.A., J.-O.S., J.Y.C., D.K.W., and J.B. analyzed data; and E.J.S., J.-H.M., D.K.W., and J.B. wrote the paper.